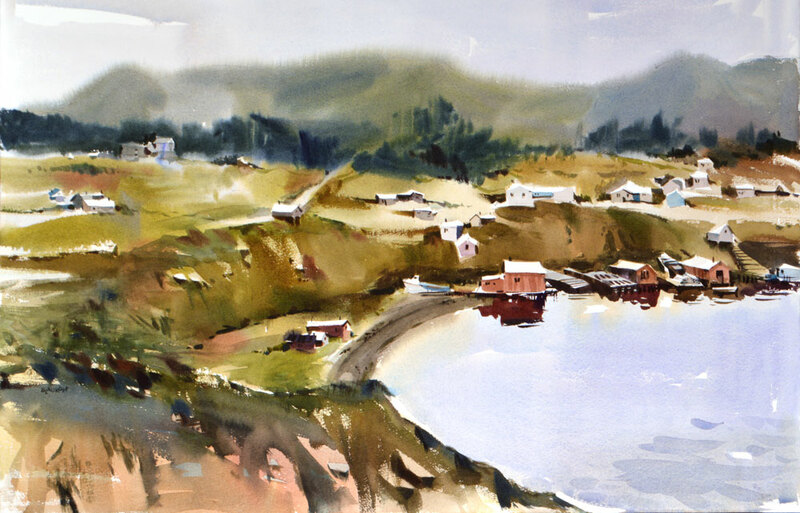 Last summer I visited both coasts of Canada and despite doing lots of sketching, I didn’t get much painting done. Now that teaching is over for the semester I have a bit of time to revisit some of the scenes that I never got around to painting. New Bonaventure, Newfoundland, is where The Grand Seduction was filmed. If you saw the movie, you’ll remember Taylor Kitsch arriving in this bay by boat while the whole town plays cricket on the upper green. It’s quite a spectacular setting with the dark hills behind. In my studio paintings I’ve been trying to work in larger formats which makes the work too big to scan. This was photographed, which is a production in itself. Getting the right lights, balancing the colour, setting up a tripod… it takes about as long to do as it does to paint the watercolour. Painted on Fabriano Artistico CP, 140 lb, 30″ x 20″. I want to visit that beautiful place AND see the movie! Gorgeous! Thanks Pat. If you get a chance to go to Newfoundland, this is very close to Trinity. It’s a beautiful part of Newfoundland. I appreciate you writing, as always! Wow – this is fantastic – very dramatic and moving. You are very kind Dee. That’s amazing….what is the trick to going big, just pretend your are doing a small painting but use bigger brushes? As a sketchbook artist I have not been able to make the leap! That’s a great question Lyn. And one that I’ve thought about a lot. Big brushes help, there’s no question about that. But the real trick and the one I’ve discovered through much experimentation and many trashed paintings, is to have enough wash on the brush and in fact, to mix up lots of wash in advance on the palette. If you don’t, your brush will run dry while you are trying to cover the larger surface of the paper and that will lead to dry looking paintings. I use a big mop brush and have it really wet for those first washes. I want the wash to be wet enough that I can go back into it with more colour before it dries. If you’d like, we can work on that during our workshop. Bring some bigger sheets of paper, for example, quarter sheets of watercolour paper, if you are used to using small sketchbooks. I’ll show you how to do a large wash. I will do that, and a few big mop type brushes. So looking forward to it! Just so wonderful, Shari! I feel like I am there, looking down at that view. Thanks so much Linda. It was a great view for sure. I really like this… going bigger seems to suit you. I like the detail in those buildings along the shoreline and the way that contrasts with the really un-detailed way that you handled the hills and foliage in the distance. The loos approach to the foreground is also interesting. My eye just keeps dancing all over the sheet. Thanks so much Ross. I am trying to work bigger and I’m really enjoying it so I really appreciate your feedback. There are so many scenes from Newfoundland that I still want to paint. It was a really special place. It is a great scene… reminds me of Peggys Cove which I visited some years ago… I could have parked myself there for a week and done nothing but sketch. That’s one place in Canada that I never visited and have regretted it ever since. We were in Halifax and Lunenberg which on either side of it but never there. Glad you got to see it. That’s funny. I have seen a well-know bit of Canada that is almost on your doorstep. It is often the way… we travel around the world to see things, but don’t get to see the things in our own backyard that people, from the other side of the world, travel to see. It is worth the effort to visit Peggy… similar to New Bonaventure but with a beautiful white lighthouse… perfect for watercolour.